Considering I go to Cowbridge a few times a week, you can imagine my husband’s face when I suggested we have our ‘explore new places family day out’ in Cowbridge! But I managed to persuade him it was a good idea when I said we would act like tourists for the day. So just like I do on holidays I started by doing a google search, and came across www.cowbridgeguide.co.uk which lists what’s on in Cowbridge. From this we loosely planned what we would do starting with a trip to the farmers market which is held on the first and third Saturday of every month in Cowbridge in Arthur John’s car park just behind the High Street. The day didn’t quite start off as we hoped, as when we arrived at the market there were only a handful of stalls. We hadn’t been for years and we’d remembered it to be a lot bigger but we were quickly reassured by the stalls that it was smaller than usual as the Abergavenny Food Festival was on and lots of the regular stalls were there for the weekend. We weren’t however disappointed with the quality of produce on offer. We had some scrumptious welsh cakes and my husband had a bacon roll from Old Cogan Hall Farm, which he devoured. We then bought some pork which we cooked for dinner on the Sunday and it was seriously good. We left the market with a loyalty card and a promise that we would make it a regular thing. After finishing at the market, we started to walk back into Cowbridge High Street and we saw that the museum in the Town Hall was open. My husband looked less than convinced about going in, so I asked him what we would have done if we’d been on holiday, to which he reluctantly replied that we would have tried the museum, so in we went! On entrance to the Cowbridge Town Hall we were hit by a rather musky smell and I did wonder whether we’d done the right thing, but then one of the volunteers came over and gave us some information and a quiz for the kids to complete on their way round so we headed in to explore. We wandered down the first corridor and saw where the old cells were and there was information in each one about the history of the Town Hall and surrounding areas of Cowbridge. It’s a small museum, but it has plenty of interesting information, and the kids armed with their quiz really enjoyed. Before leaving they were given a certificate for their visit so they left very happy and even my husband admitted that it was good fun. From the museum we headed to the park which is just behind Waitrose It’s a nice park with plenty for all ages, there’s enough there for toddlers and bigger kids too. From the park we then headed up to St. Quentins Castle in Llanblethian. It’s about a 20 minute walk for little legs and for us pushing a pram, up a relatively short but steep hill. I’d never been into the Castle before, as I hadn’t realised that it was open to the public. 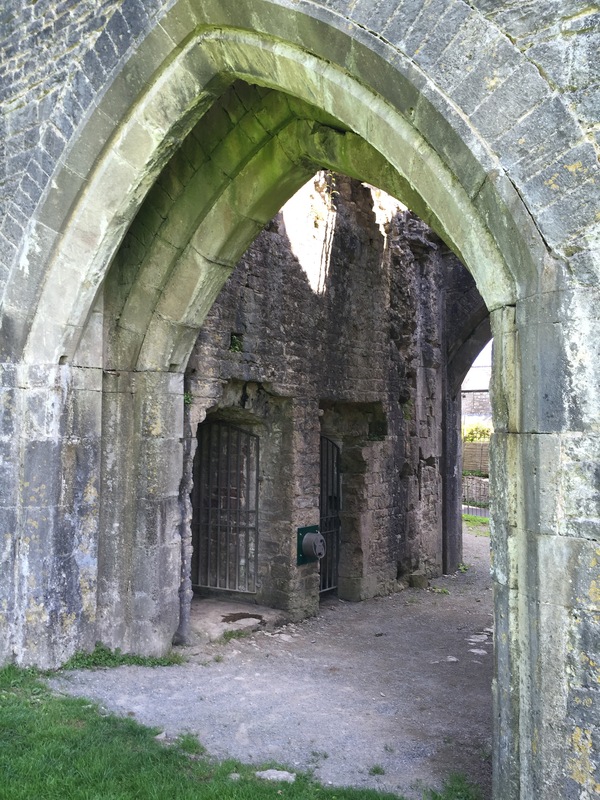 The castle is fantastic for children as you can go up the stairs and there is a bridge across the top of the ruin which gives a great look out with spectacular views over Cowbridge and Llanblethian. The grounds are also good to have a run around in, and if we’d been organised enough would have been a great spot for a picnic. Instead we headed back into the town to try somewhere for lunch. It was gone half one by now and we were all pretty hungry. As it was such a glorious day we wanted to eat outside, but finding a table outside was looking impossible. Luckily enough, by hovering outside The Penny Farthing we managed to find a table in their courtyard, which was a real suntrap. We had a lovely table with a big umbrella to keep us cool. The Quarter Penny is very family friendly, it has the usual high chairs, a box of toys for loan and a children’s menu. The food was all of a good standard, and the kids devoured their meals followed by some very chocolatey ice-cream. After lunch, we headed to the Cowbridge physic gardens. The gardens were beautiful and in full bloom. They are so peaceful (except of course when my little one ran through them letting everyone know she was there – sorry if you were there at the time!). The kids loved looking at the fountain and smelling the different scents from the flowers, particularly the lavender (let’s hope they sleep tonight!). From there we went through to the fish pond at the back of the library, which kept the kids entertained for some time as there were some new baby fish. We then headed home after a very full and fun day out. Considering this was all on our doorstep none of us could believe that we hadn’t been to the museum or castle before and the kids said that it had been like being on holiday. If you haven’t been to Cowbridge, it’s definitely worth a visit. In addition to what I have mentioned it also has some great, individual shops and restaurants. Also the parking is good, with free parking available. We keep meaning to visit Cowbridge as it is quite near us. I’ll make sure we visit the castle, I didn’t even know it was there. Thanks! If you live close it is so worth a visit, lots of unique shops to browse in and lovely restaurants too.